Should you use heat or ice on your painful injury? The best method of solving this important riddle is to assess the nature and source of the pain. Essentially, a new injury, that is, one that you sustained within the last 48 hours, is best treated with ice. Chronic pain, or pain that you have had for a long time, is generally best treated with moist heat. 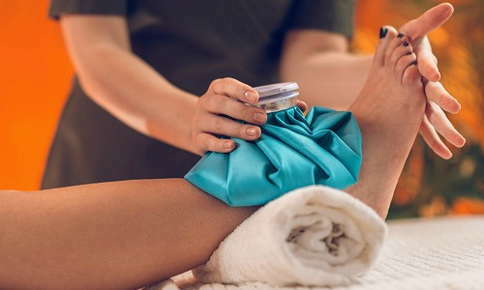 Understanding the mechanisms of injury and the physiological and biochemical causes of pain helps us to differentiate the indications for applying ice or applying moist heat. The primary rule is that you can never go wrong with applying ice. Ice calms things down and, although an ice application may be uncomfortably cold for a few moments, the overall effect is soothing. Cold decreases local metabolism and constricts small blood vessels (arterioles). Cold reduces nerve conduction velocity, that is, the speed at which nerve impulses are transmitted, and therefore reduces the number of pain signals that reach your brain per unit time. Thus, ice applications provide vasoconstriction, analgesia, and sedation. Ice is indicated for acute musculoskeletal injury, burns, insect bites, bleeding, and snake bites. Ice should not be used for gout, rheumatoid arthritis, Raynaud's phenomenon, history of vascular impairment, and cold allergies. As well, ice should not be used for a patient in a coma. Moist heat increases local metabolism and dilates small blood vessels. Vasodilation results in increased nutrition, increased activity of white blood cells (phagocytosis), and increased removal of waste (metabolic end-products and damaged cellular structures). Moist heat provides analgesia, sedation, and reduces muscle spasms. Heat is best for chronic pain and muscle spasms. Contraindications to moist heat include acute musculoskeletal injury, area of diminished sensation, acute skin conditions, pregnancy, malignancy, diabetes, encapsulated swelling, hemorrhagic disorders, and suppurative conditions. Generally, ice applications are used for acute injuries within a 72-hour time frame from the onset of the injury. Acute injury damages local capillaries, causing blood to leak into the spaces between cells and tissues, where it doesn't belong. Such uncontained blood causes pressure on local nerve endings, creating pain. Also, pressure is applied to nearby cells, causing extended injury and possibly cell death. Thus, limiting the amount of blood leaking out of disrupted capillaries is critical in slowing the effects and reducing the impact of musculoskeletal injury. Ice performs this function. Ice reduces swelling, reduces pain, and provides a sedative effect. When applying ice, it's very important to avoid damaging the skin. Ice packs should always be wrapped in a towel. Ice should rarely be applied directly to the skin. Duration and frequency of ice applications is not an exact science, but a useful guideline is to apply ice for 15 minutes every two hours for a moderately acute injury, using three to four ice applications per day. However, you will know instinctively when the time is right to apply the next ice pack. Moist heat applications follow similar guidelines. Dry heat should never be used. Moist heat packs should be wrapped in a towel and are applied for 15 minutes every two to three hours, up to several applications per day. Recovering from injury requires your body to put forth a great deal of effort and requires support from the nerve system, the body's master system. Regular chiropractic care provides great assistance in the process of recovery from an injury. By detecting and correcting spinal misalignments and sources of nerve interference, regular chiropractic care helps ensure optimal functioning of the nerve system. Thus, regular chiropractic care helps facilitate your recovery and helps you return to your full range of activities as quickly as possible. Sign up now for a free consultation!